Ah dessert. It’s one thing I’m not too keen on—a travesty, friends would insist. I wasn’t born with a sweet tooth and while I eat cakes and pastries as a snack, I almost never eat it to cap off a meal. But even if I decline dessert a lot, there are still a few sweet treats I never turn down. Still, a fruitful visit to Salcedo Market gave me something to photograph for Lasang Pinoy â€“ Sundays’ Dessert theme. 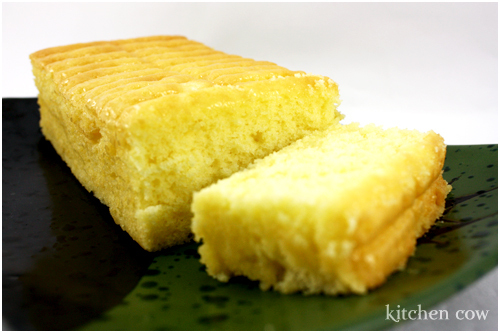 In the form of a delightfully rich, yet plain looking butter cake. As unassuming this famous butter cake may look, the simplicity hides a rich, buttery taste that’s never too sweet. Heavier than a sponge cake but lighter than a pound cake, it has a nice, texture that is pleasantly dense yet melts in the mouth. Finished off with a sweet, lightly crusted top, this unforgettable butter cake makes me forget that I don’t have a sweet tooth. Sold in large rectangular sheets, smaller loaves and single slices, these heavenly cakes are packed in non-descript blue floral boxes that say home-baked with loves of love rather than commercially mass-produced. They sell every weekend at the Salcedo Saturday Market and at their stall at Food Choices in Glorietta. Grab a box and discover what I’m babbling about, if you’re not yet familiar with it. Chances are, you’ll be as hooked as I am, sweet tooth or not. This entry was posted in blog carnivals, food spotlight, restos & eateries. Bookmark the permalink. I love Vargas’ butter cake – I get the small rectangle, around 15 slices, and in fits of emotional distress, eat it all! The followup sugar and fat coma is sometimes worth it. Sometimes. ha! They also make a great bibingka and brazo de mercedes that needs refrigeration so only buy it if you have a cooler with you. my apologies for the late reply…got caught up in a much deserved weekend break! anyway, count me for not having a sweet tooth! i guess it’s all the cakes and ice cream i had during childhood…but if you say these butter cakes aren’t very sweet…then shove ’em my way! That’s also the size I bought! Buying the whole large rectangle is dangerous for my health, hehe! I’ll try the bibingka next time but I think I’ll pass on the brazo. That’s one dessert that I find a bit too sweet for me. Grab grab grab! Really good, I think there’s a branch at Glorietta. Your description of it makes me want to taste that yummy butter cake.. NOW!!! Too bad I’m a looong plane ride away from Manila (*sigh!*). Will definitely try it out when I visit again in June! Thanks for sharing! Oh, please do make room for it during your vacation. It’s really delicious.